Google's latest Gmail phone calling feature hit the ground running with over one million phone calls placed from Gmail in first 24 hours the feature was available, Google said Thursday via Twitter.The big question is how many will make Gmail calls in the following 24 hours after people have gotten over the novelty of placing calls via their e-mail inbox. This isn't terribly surprising that Google is has seen such day-one success considering Gmail has over 175 million monthly users, and the new feature is basically a combination of two popular services Gmail Voice Chat and Google Voice. 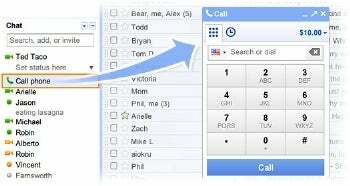 The feature, which is currently only available to U.S. Gmail users, allows users to place free "local" (within the United States and Canada) phone calls, as well as cheap international calls. Google says it's subsidizing the "local" calls with the international calls' rates, though these rates are still quite low. You can call a number of countries, including the United Kingdom, France, Germany, Argentina, China, and Japan, for as low as two cents per minute. Google says that the local calls are free for now, and will be through at least the end of this year. However, things may change as the service catches on (though it looks like it already is). The feature is not yet available to all U.S. Gmail users. It's quite simple to use, however--at the top of your chat bar there is a "call phone" option. Simply click on it and a number pad will appear, on which you can dial your desired number and place a phone call. Naturally, a microphone is necessary in order for you to be able to communicate with the person on the other end of the line. If you're just a regular user, the recipient of your call will see your phone number as 760-705-8888. If you have Google Voice, however, the two services will integrate and the recipient of your call will see your Google Voice number. At the moment a lot of people are still wondering why Google has decided to roll out this feature at all (to up the interest in Google Voice? Have a head-to-head battle with Skype?). But, while it's free, we may as well take advantage of it--here's to a million more calls over Gmail in the next 24 hours.